Discover the mystical allure of rich, royal blue and sparkling golden specks found in lapis lazuli. Very few gems have such a long and storied history as lapis lazuli. Along with carnelian, it is the oldest known gemstones to be appreciated and worn as adornment. 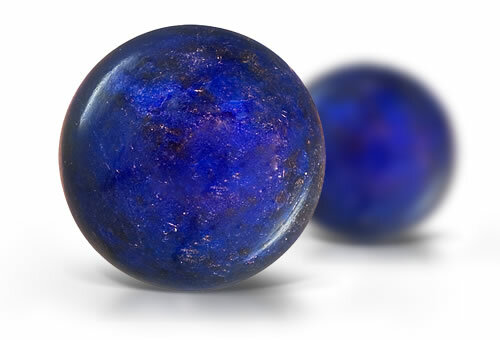 When lapis lazuli was first introduced to Europe, it was called ultramarine, meaning "beyond the sea." The gem was ground to a powder for use as early eye shadow, and as pigment for early oil paints. Today, this rich blue gem still retains the allure that first captivated humans thousands of years ago. Some areas of the stone might have a RI of 1.67 due to calcite inclusions. Lapis lazuli is a mixture of lazurite, calcite and pyrite. Lapis lazuli commonly contains pyrite and white calcite. The pyrite inclusions in natural stones are randomly scattered throughout the stone and have irregular outlines that are surrounded by darker blue rings.